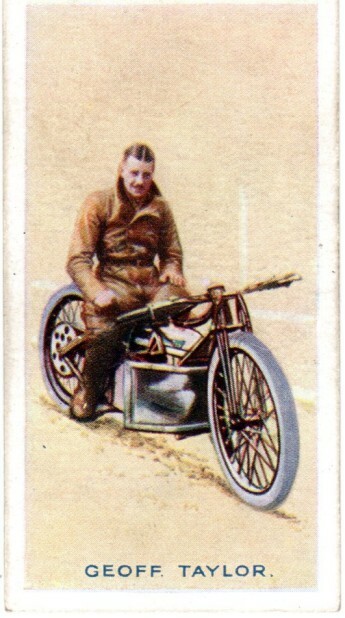 I received an incomplete set of scans of these cards from Rodger Stubbings, which were on the website for quite a while then another set, but this time complete set (from David Pipes) was received. 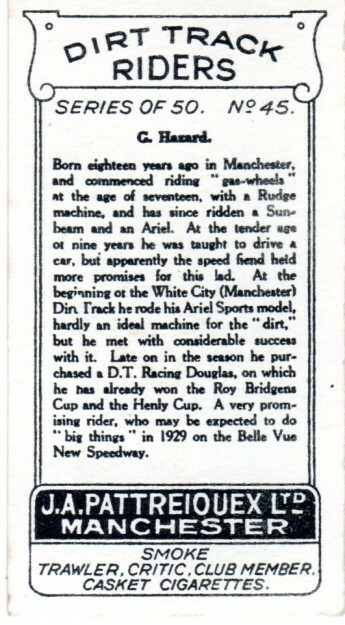 Due thanks and respect to Rodger as I have chosen to show David's cards for this page. 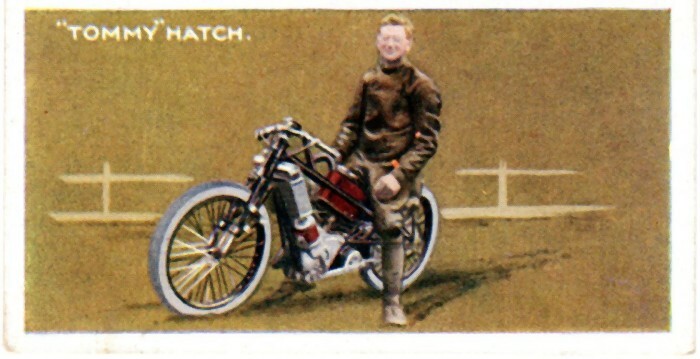 The artwork shows a likeness of a Scott Machine. 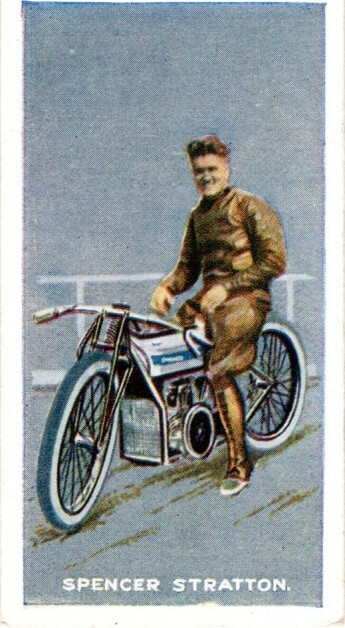 The Scott engine was unique in speedway. 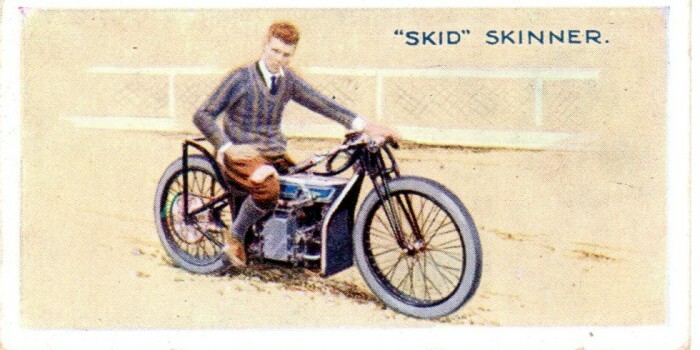 A single cylinder 500cc water-cooled 2-stroke. 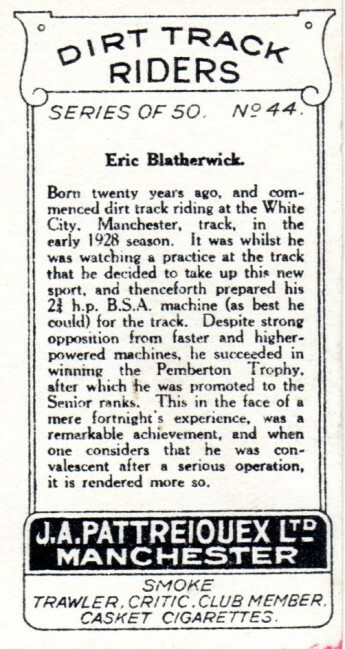 A big two stroke like this must have howled at full throttle. 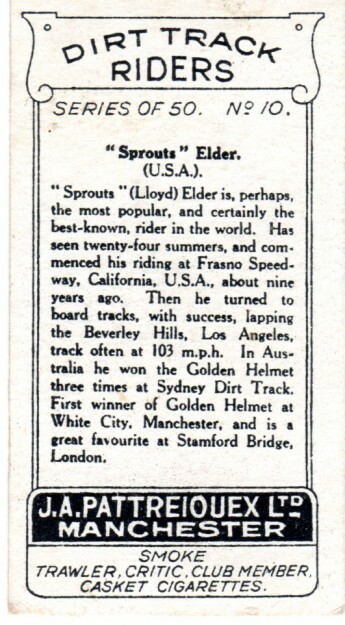 The card says Sprouts rode "Board Tracks" This form of motorcycle racing originated in the USA and I have yet to see any evidence of Board Tracking anywhere else in the world. 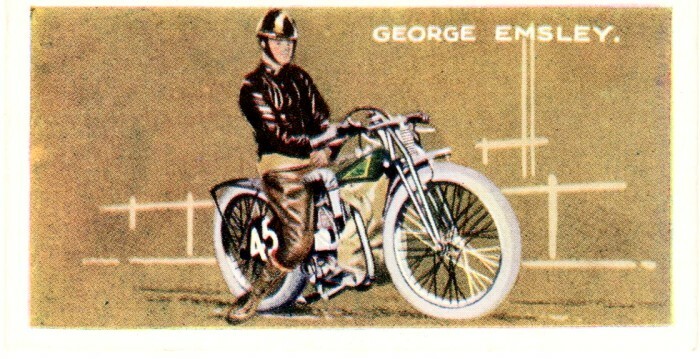 George a British rider started with a British bike "Royal Enfield" Enfields were common on our roads until the 1970s. 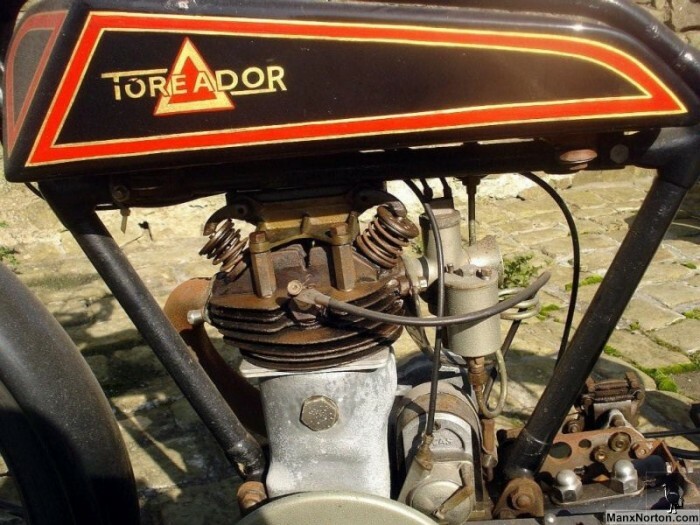 I wonder if a Toreador engine like the one shown above was used by Norman Dawson? 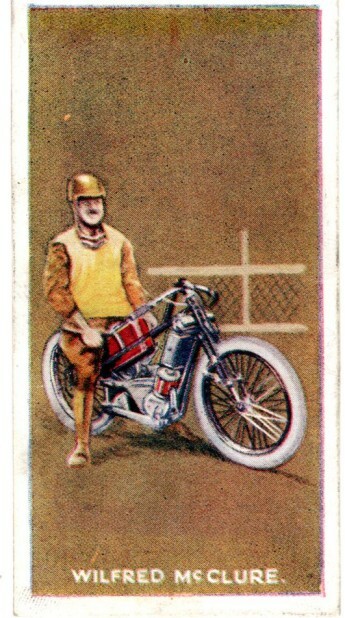 The cig card says Norman's Toreador was unsuitable for speedway and this specimen doesn't look very robust. 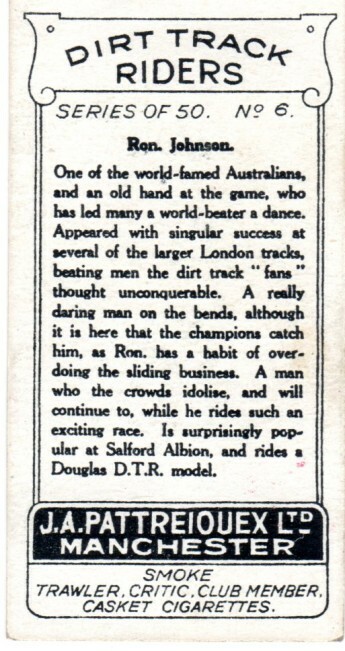 So the Douglas, Rudge and JAP were not challenged by the Toreador which has time-slipped almost into obscurity. 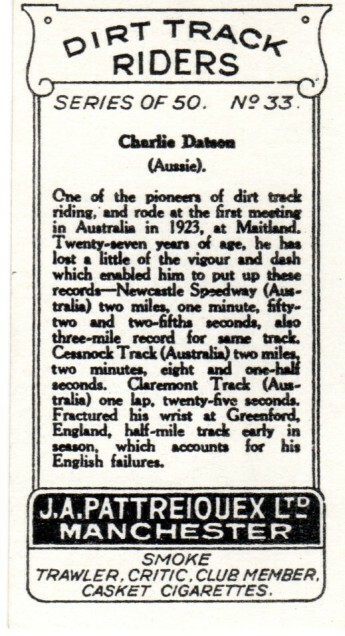 Clem was a communist and he joined the International Brigade and was subsequently murdered by fascists when he became involved in the Spanish Civil War. 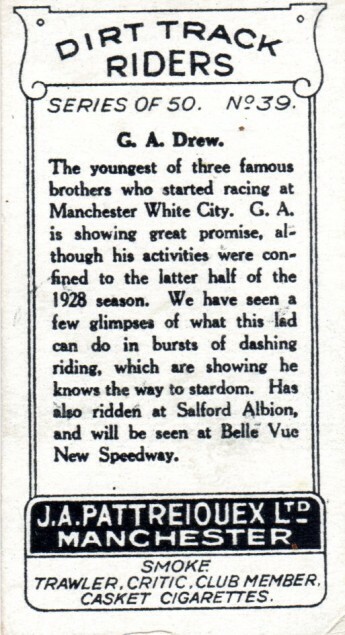 Clem also played a major part in setting up a union for speedway/dirt track riders who were being exploited by unscrupulous stadium owners who were encouraging young inexperienced kids to ride these bikes which resulted in deaths and serious injury. 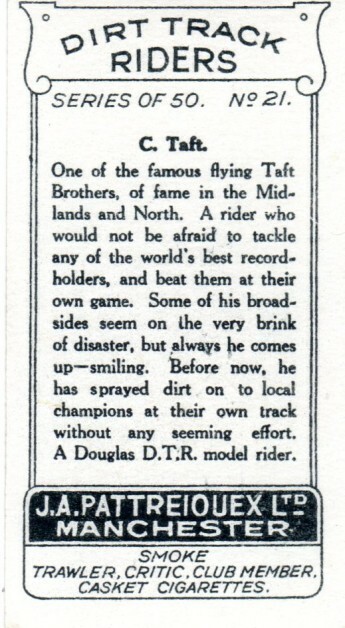 If his life wasn't dangerous enough he also rode on the Wall of Death. 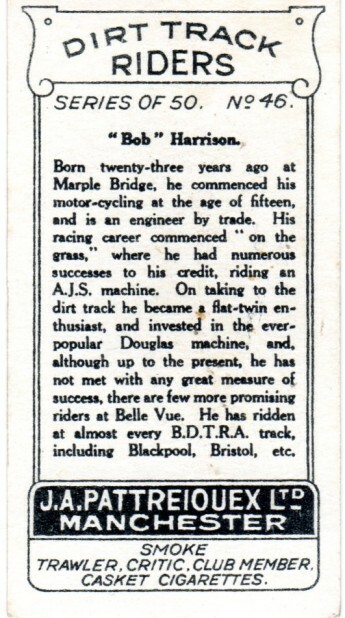 Ron started on a Cotton machine but is pictured on a Douglas. 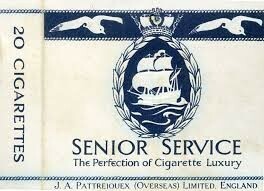 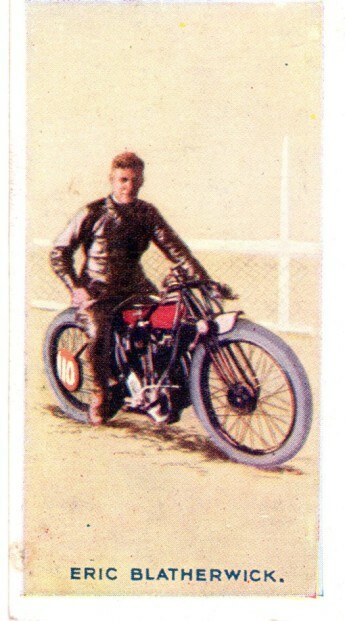 John says: The cigarette card says Spencer was an Australian. 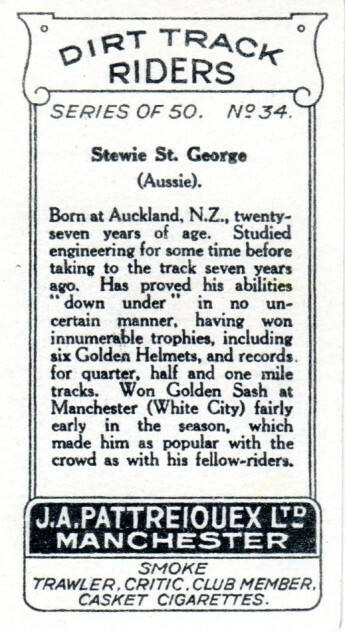 I always thought he was a New Zealander! 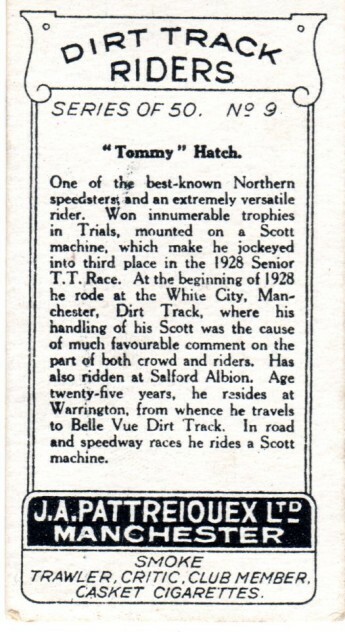 He was team manager of the Newcastle Diamonds pre war and on the way back from Newcastle's away match at Workington he lost his life in a road traffic accident! 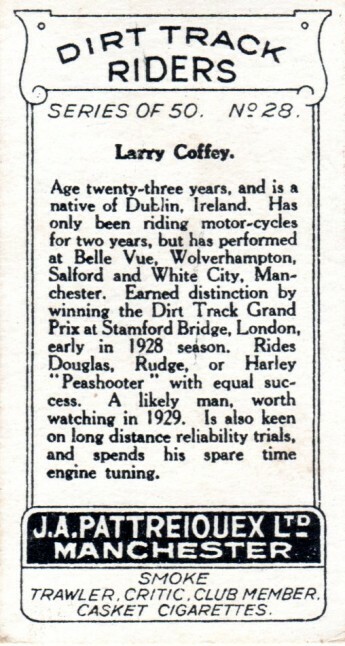 Larry was successful on Harley Peashooters, Rudges and Douglasses. 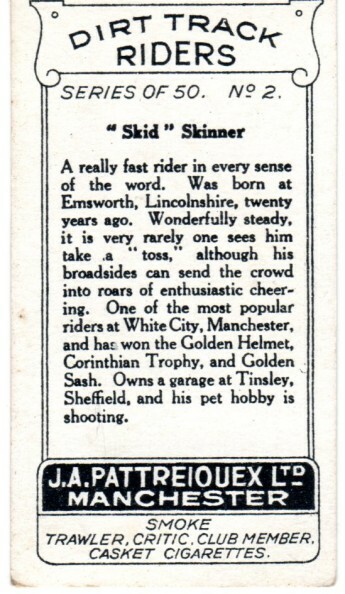 He never quite made the grade to be a famous early rider despite his versatility on different machines. 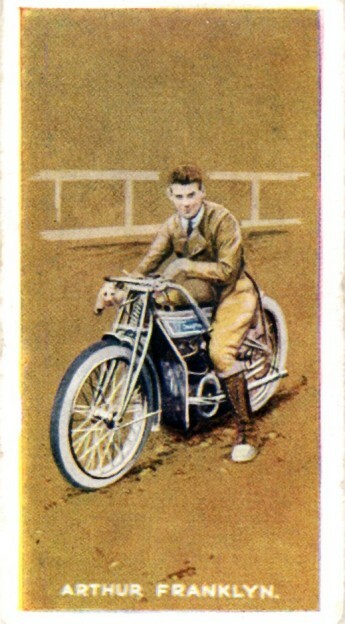 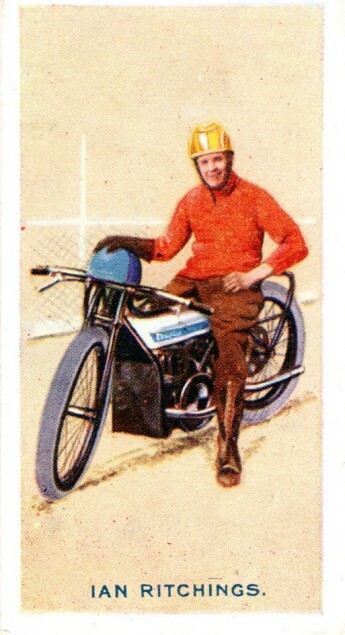 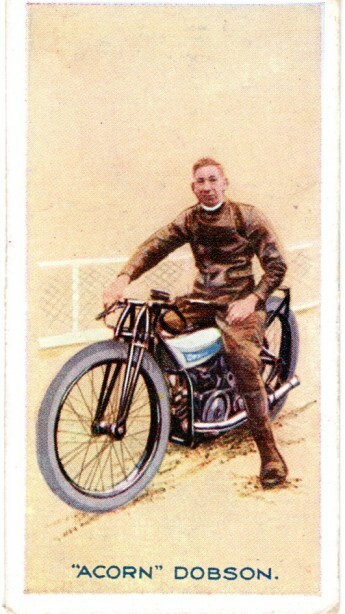 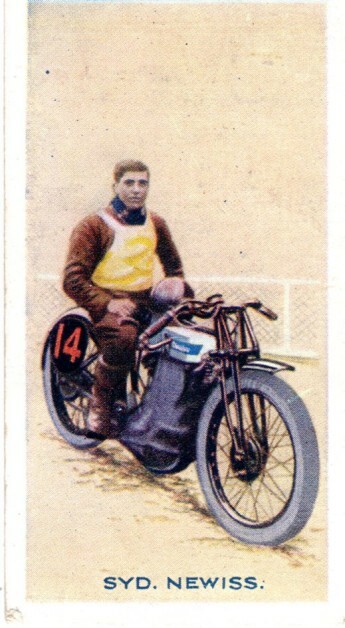 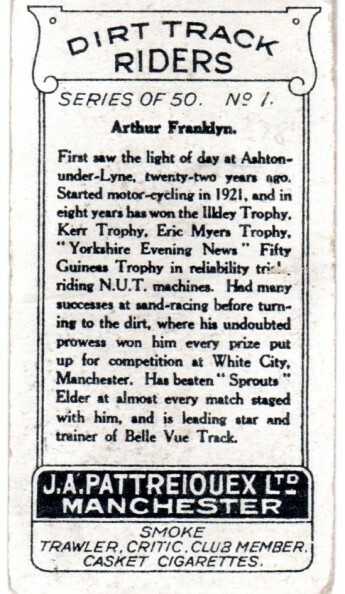 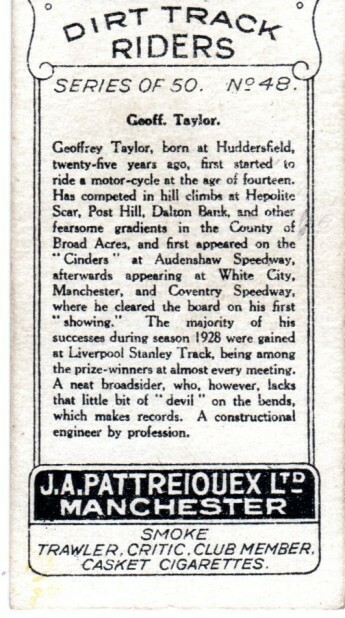 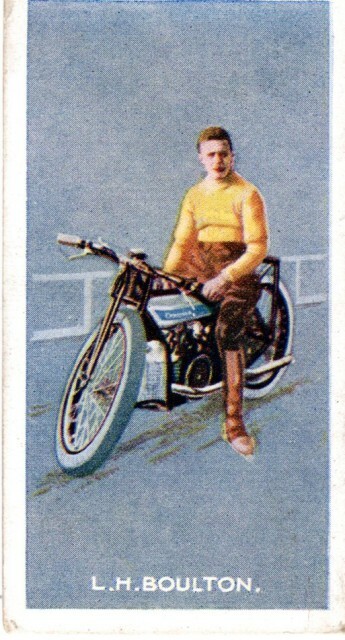 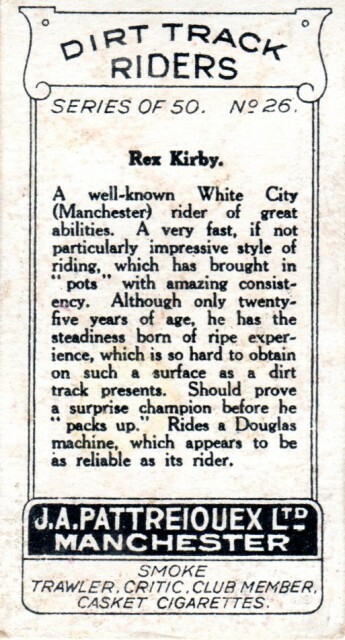 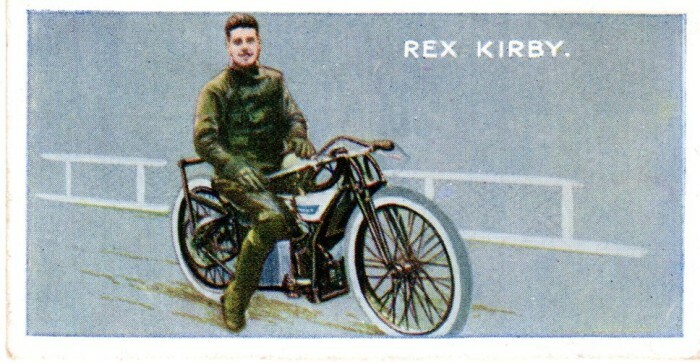 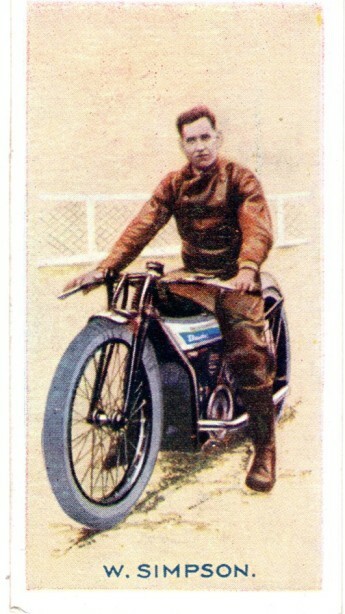 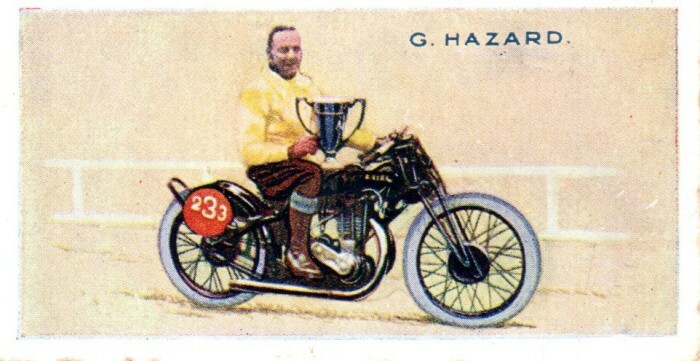 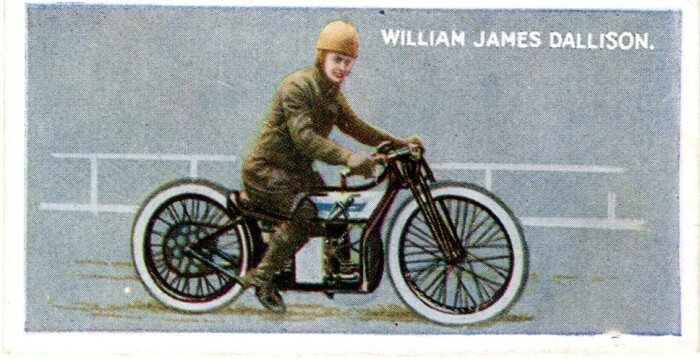 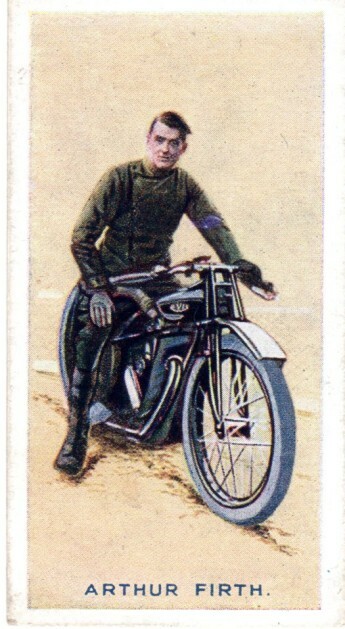 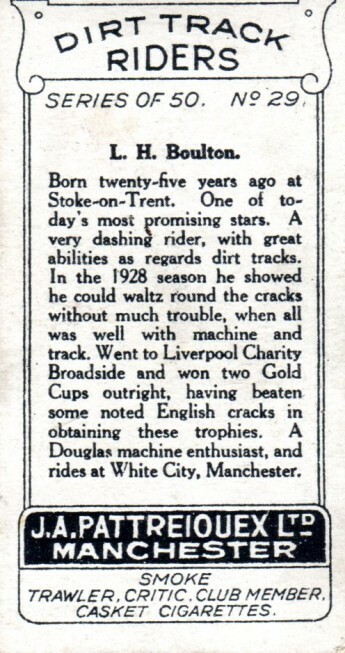 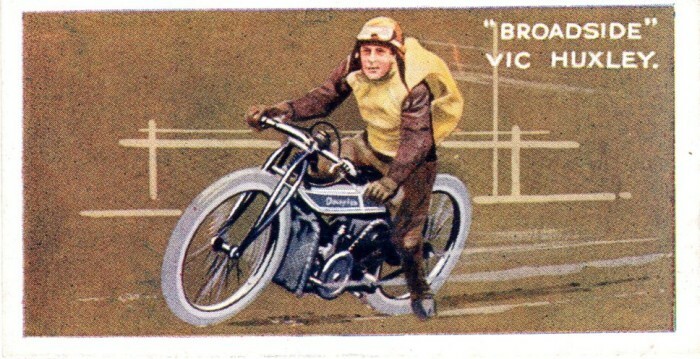 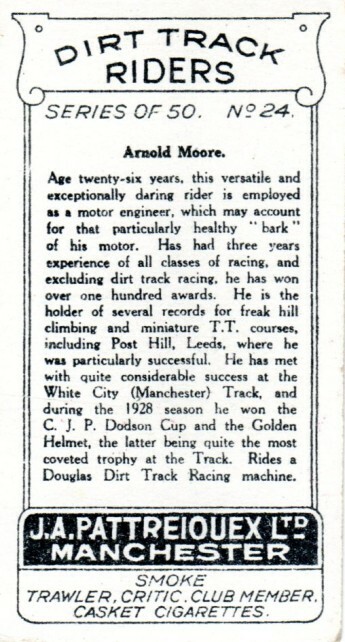 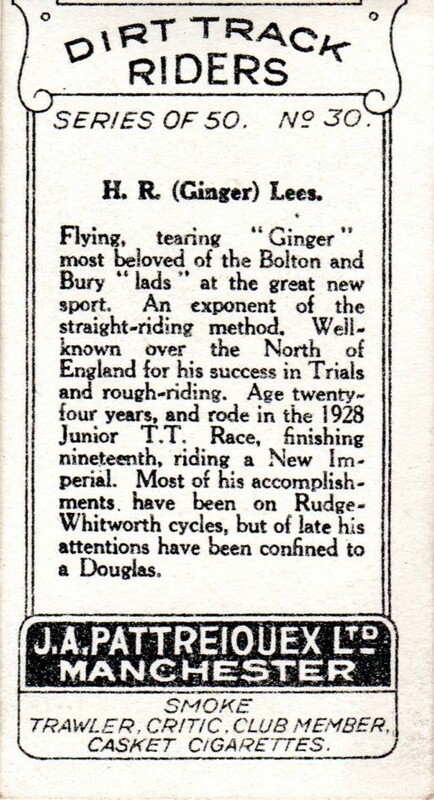 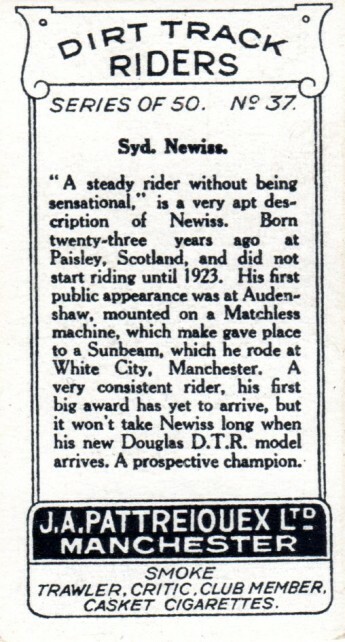 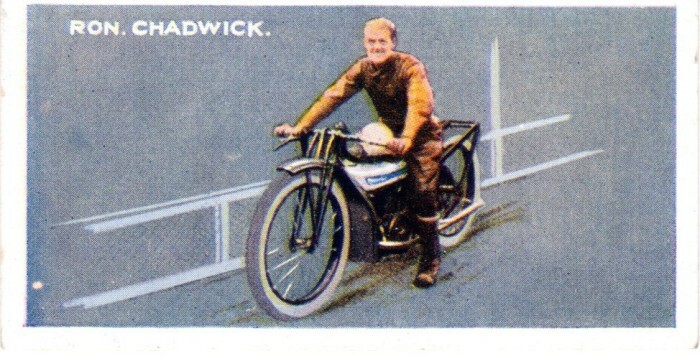 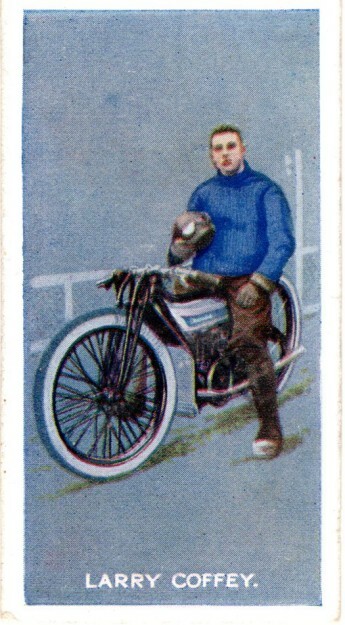 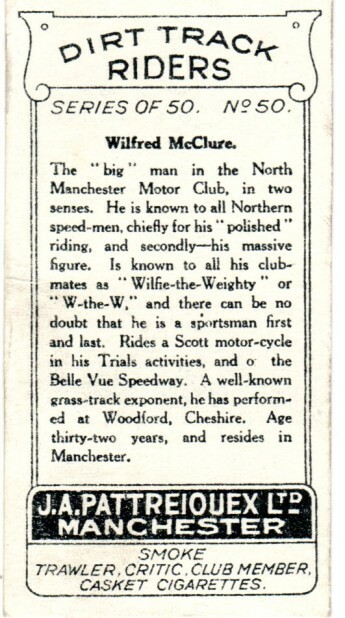 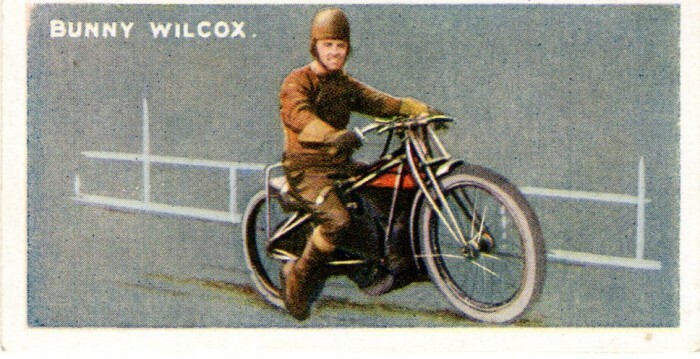 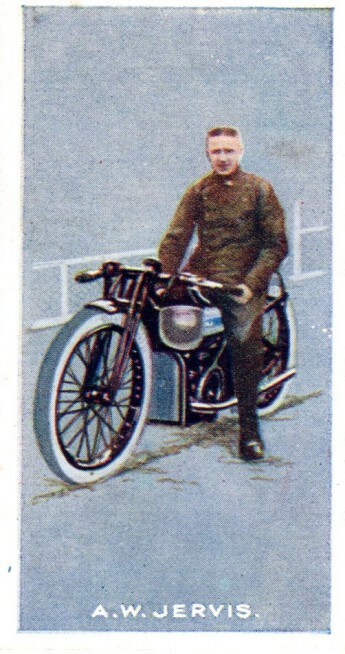 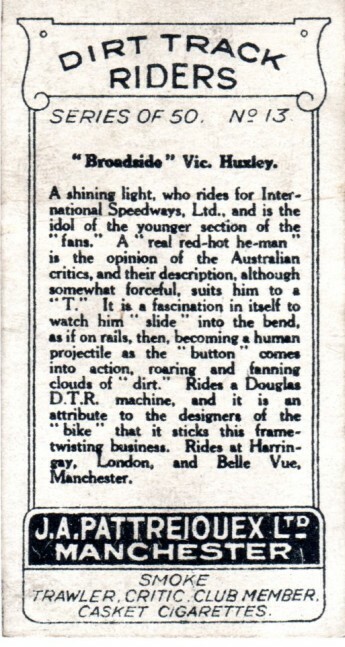 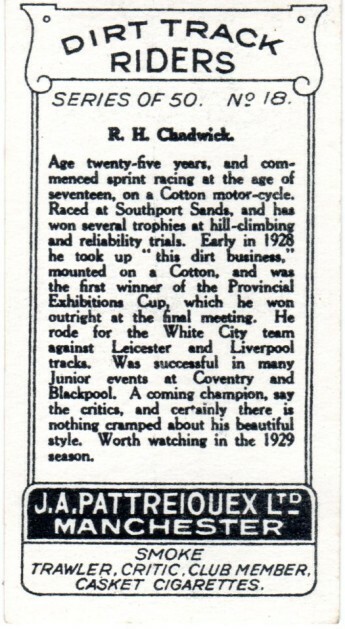 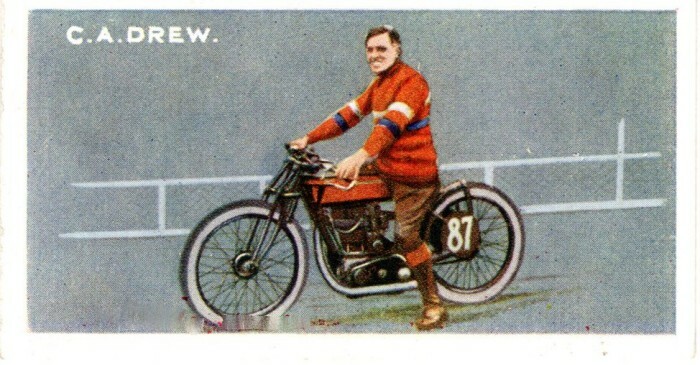 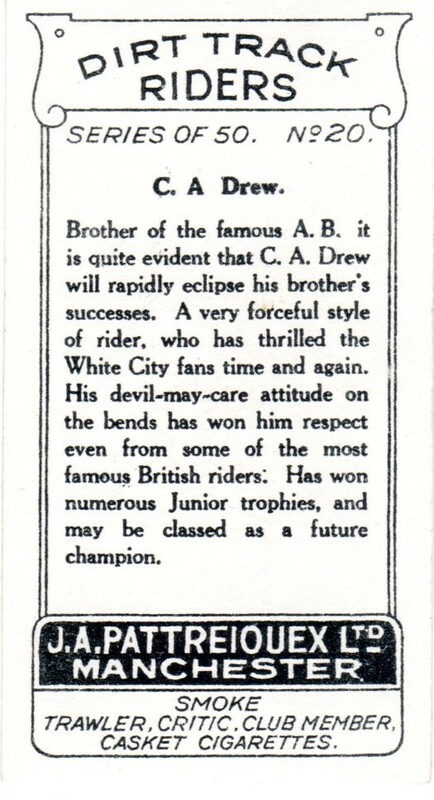 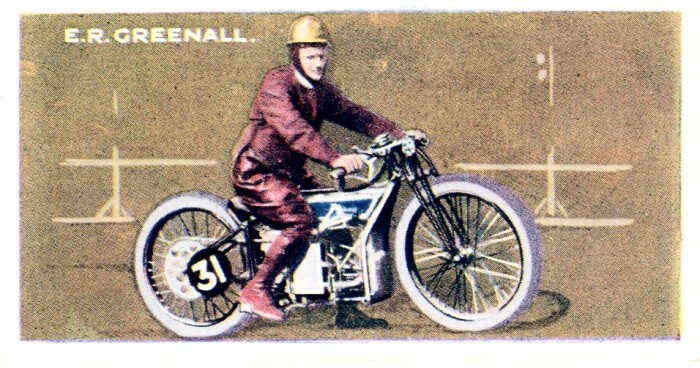 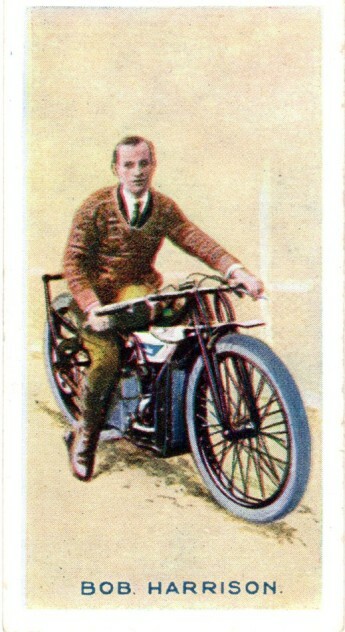 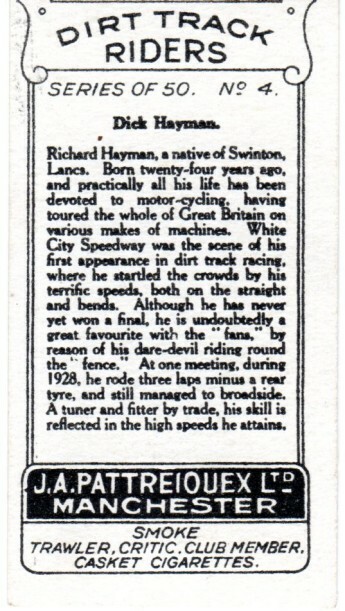 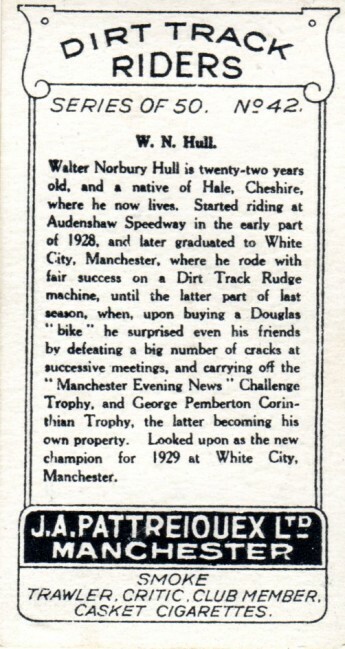 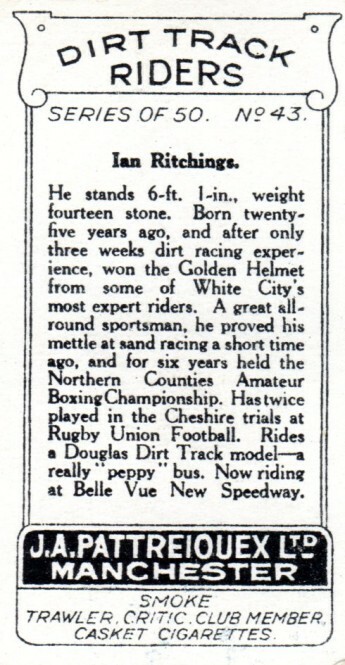 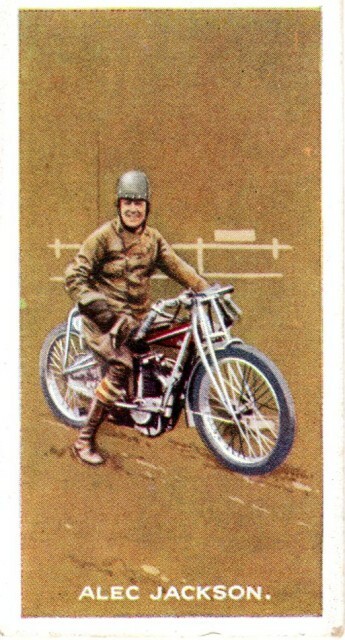 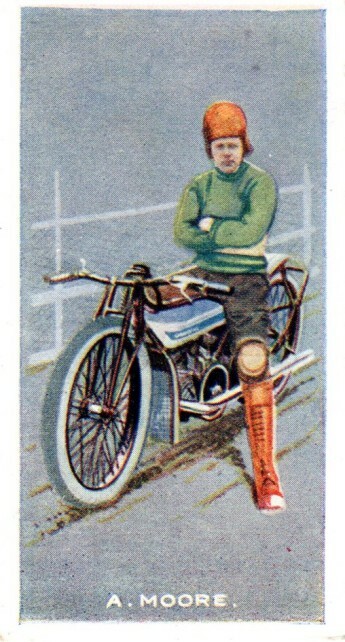 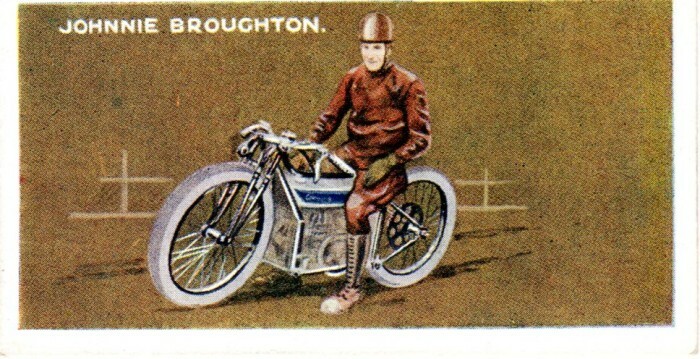 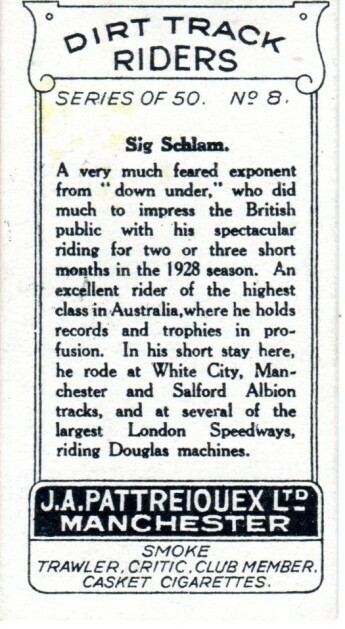 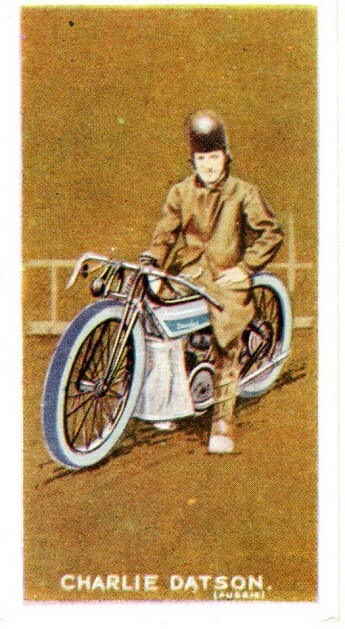 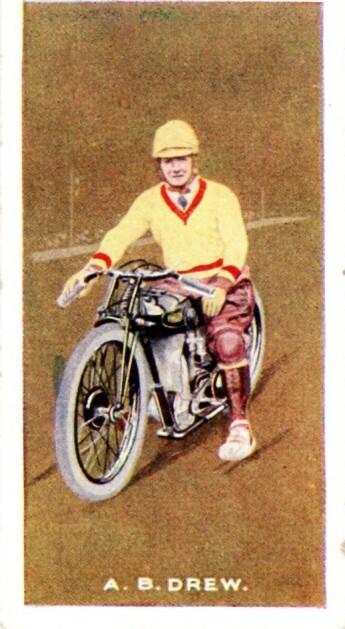 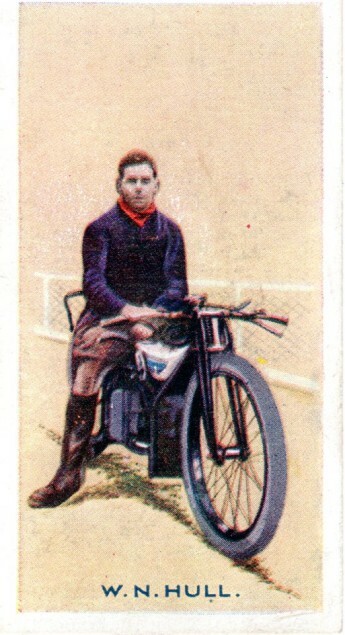 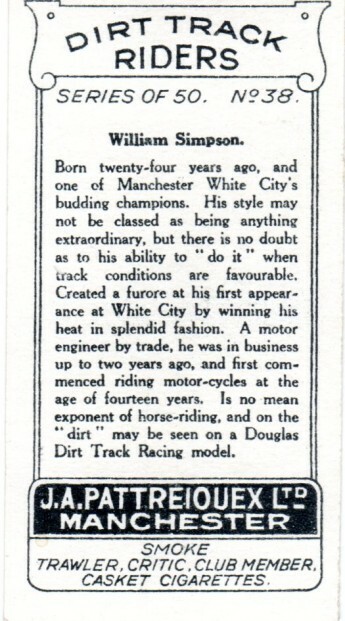 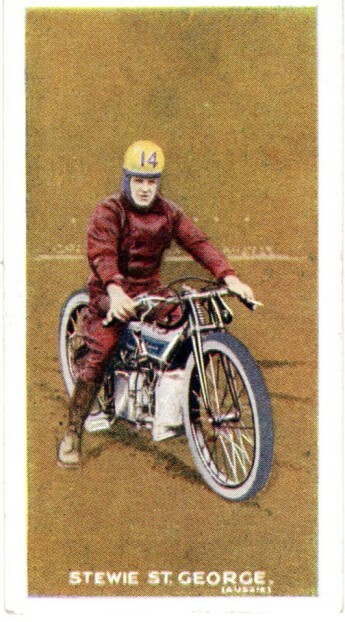 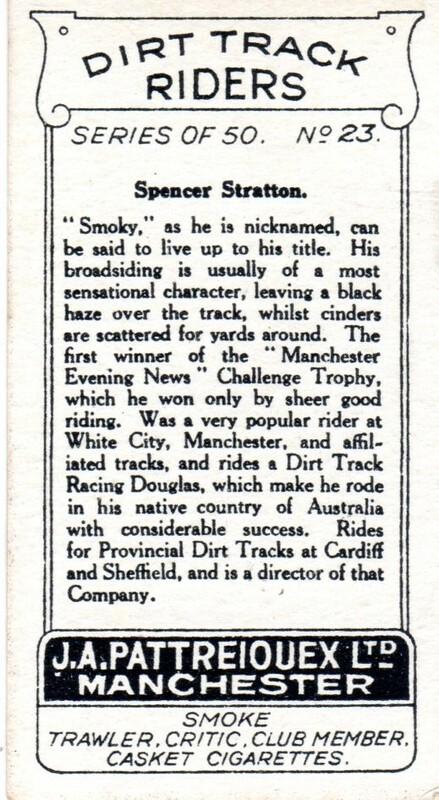 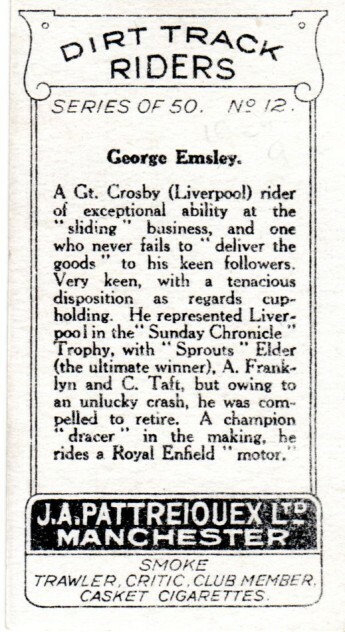 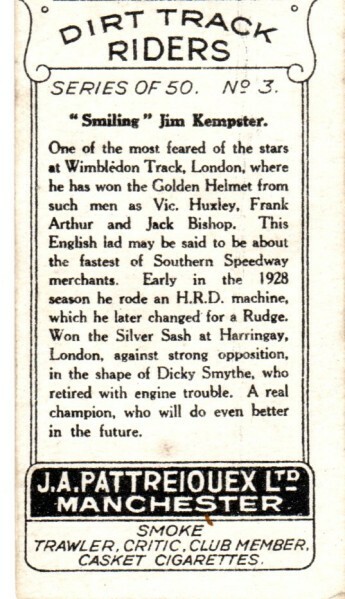 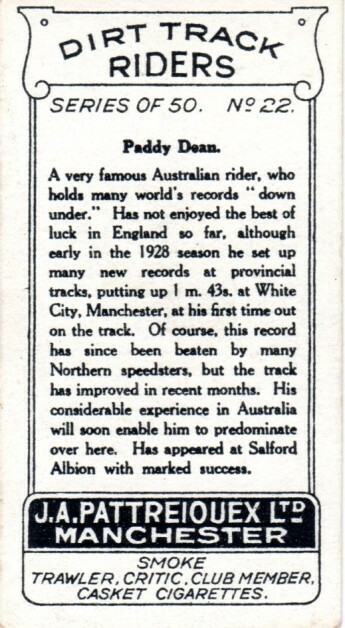 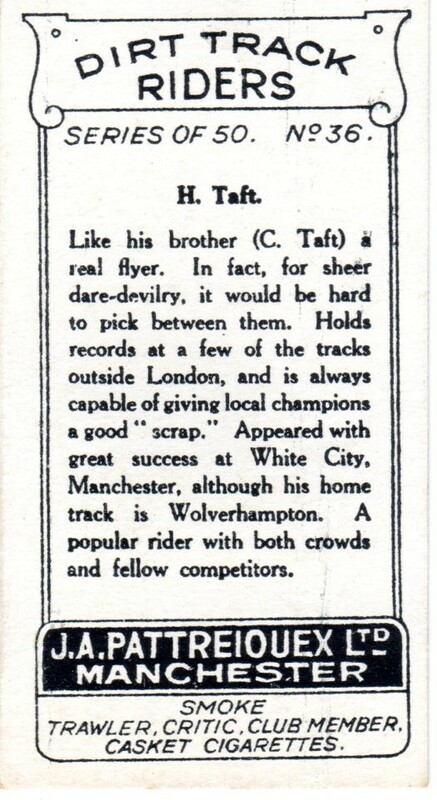 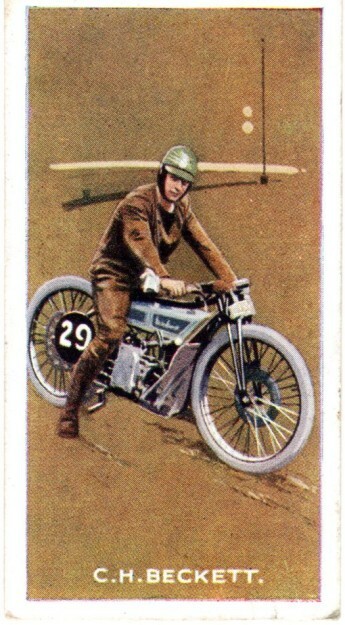 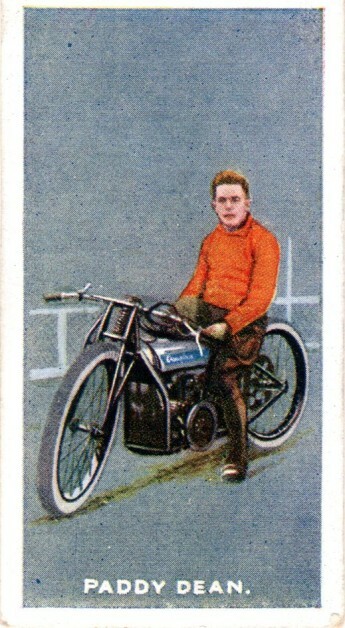 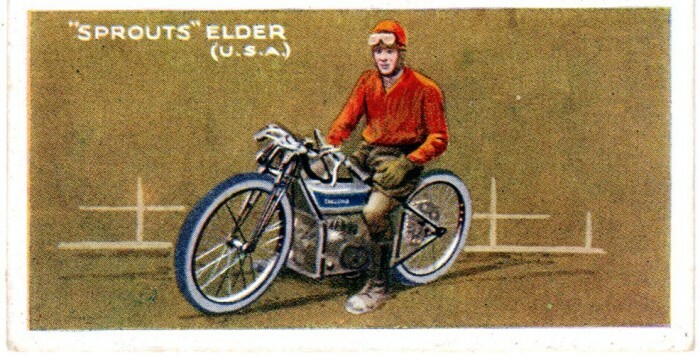 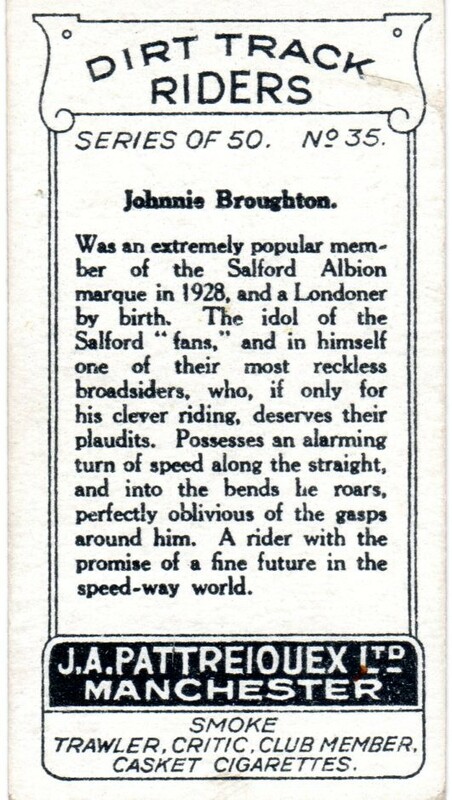 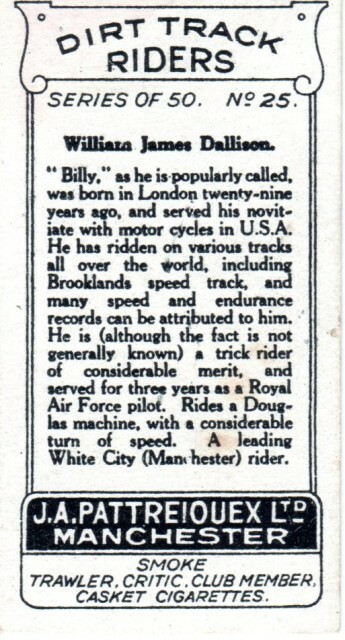 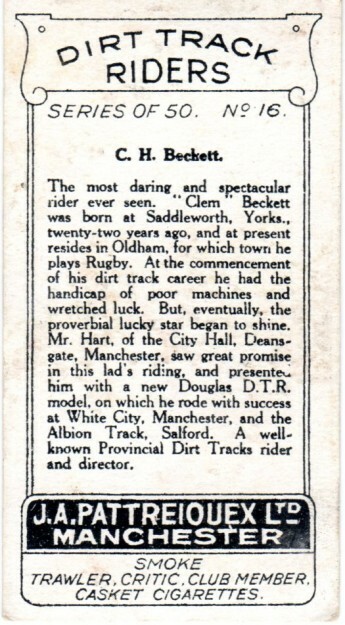 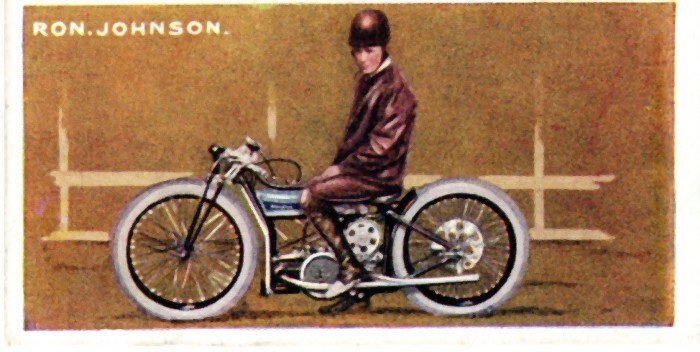 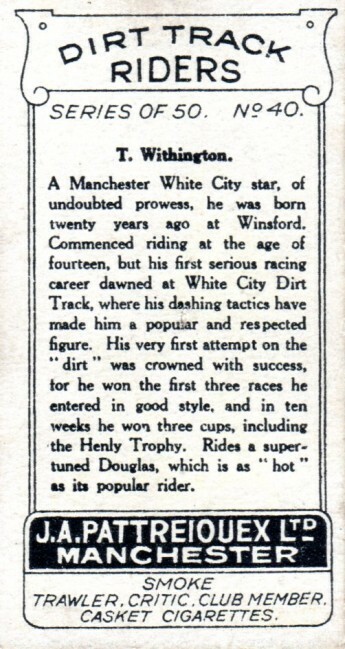 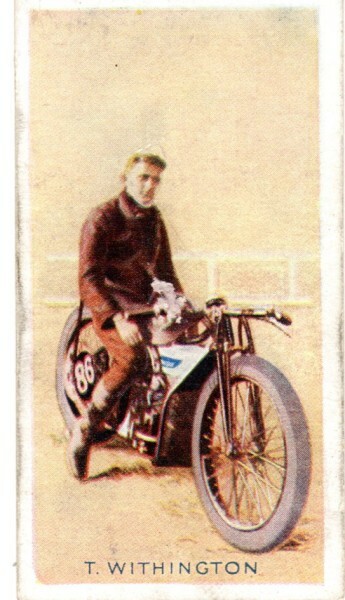 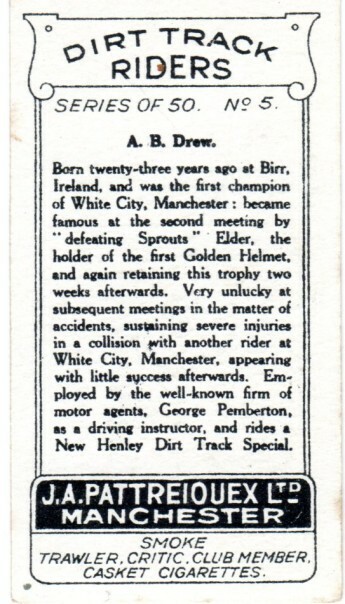 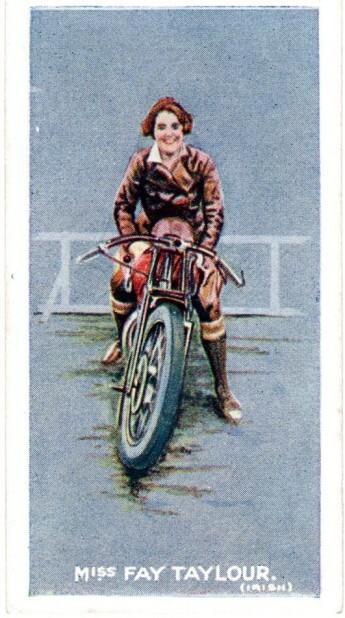 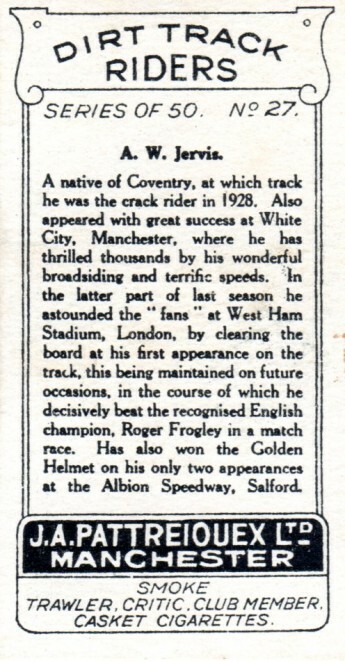 Ginger was a Rudge rider as shown on his card but switched to the Douglas and had greater success. 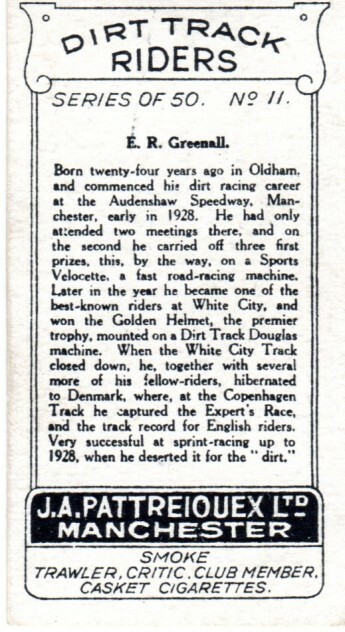 He rode in various motorcycle sports but was most successful in speedway. 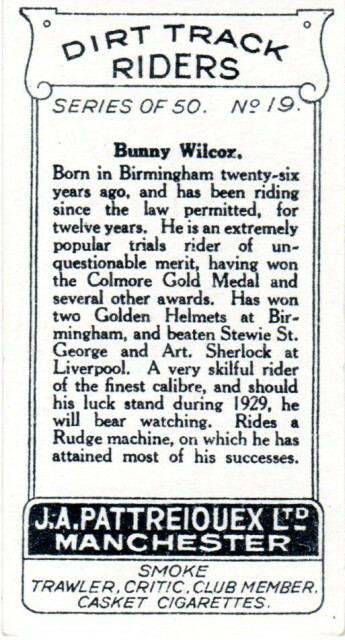 I believe the Rudge suffered from flexing of the frame. 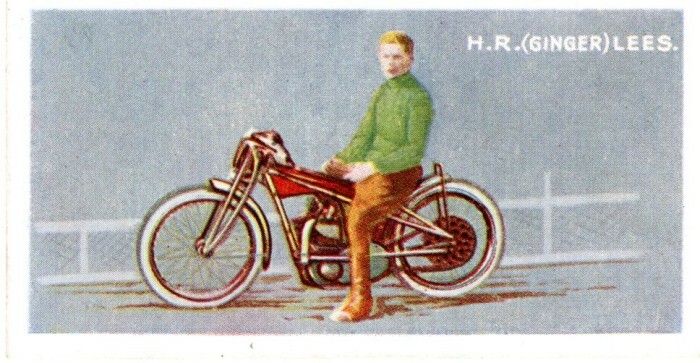 The factory strove to correct this and Rudge's are recognisable for their red tank, upswept exhaust and strengthening struts as can be seen on Ginger's bike. 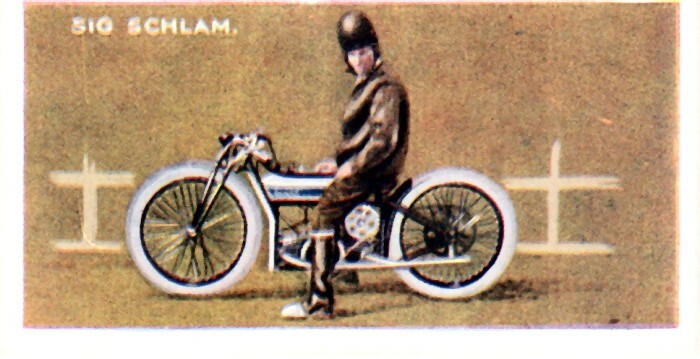 If they had invested in designing a better frame perhaps the JAP may have had a British competitor which would have been great for British speedway. 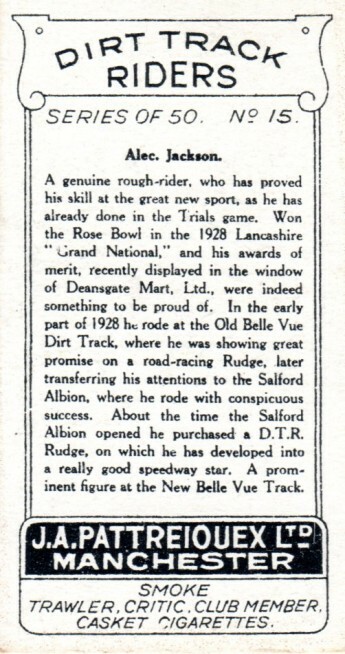 Rudge didn't invest and soon went out of business. 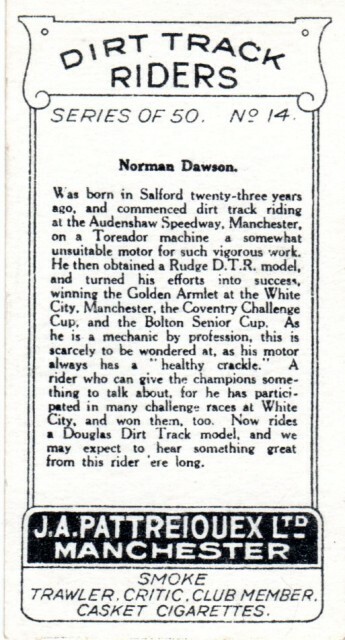 My only comment. 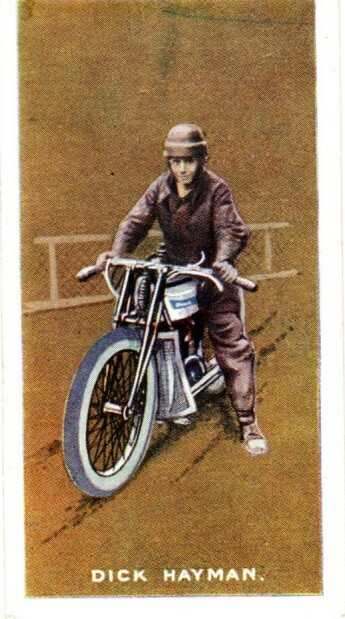 A lady rider who competed against a male dominated sport. 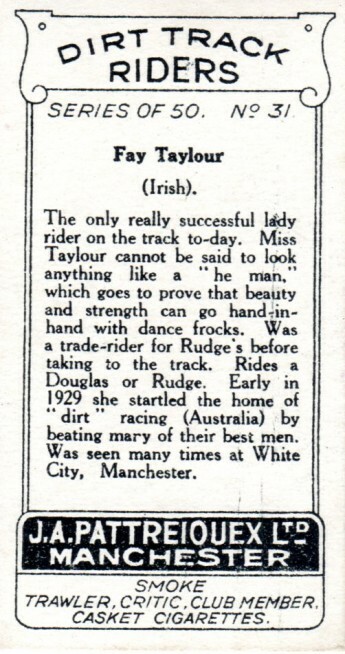 There were other lady riders but Fay was the pick. 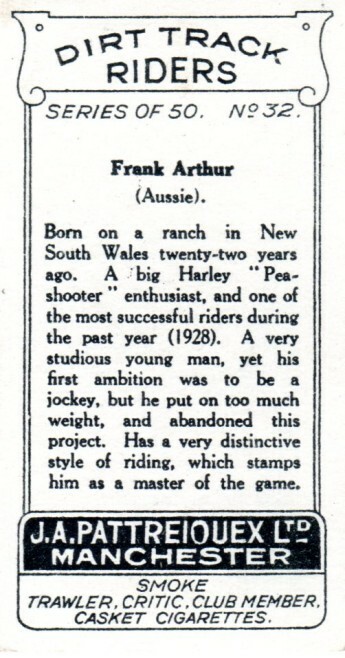 Franks card says he was a Harley Peashooter man. 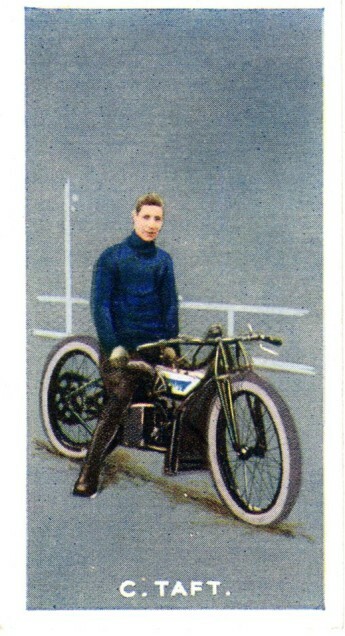 The artistic picture shows engine Guards which makes it difficult for me to say what machine he was seated upon! 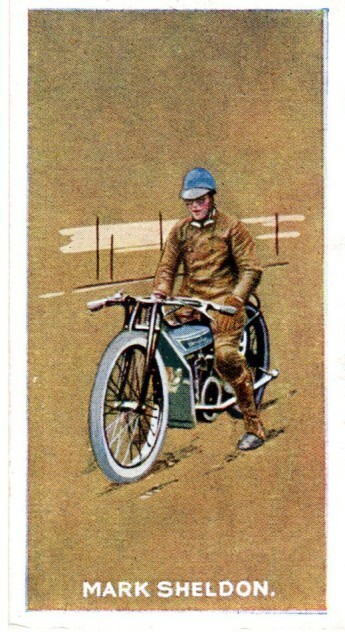 The petrol tank maybe a Rudge but artists on these cards often get the bikes wrong. 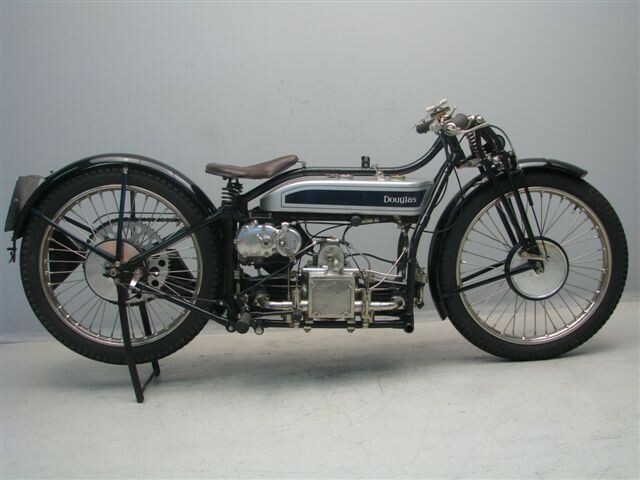 All I can say is the bike is not the most common of 1929 a Douglass. 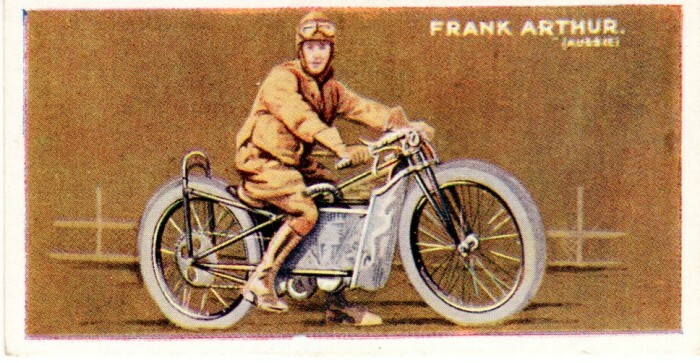 Maybe Frank had a Peashooter and fitted the shields to protect his machine? 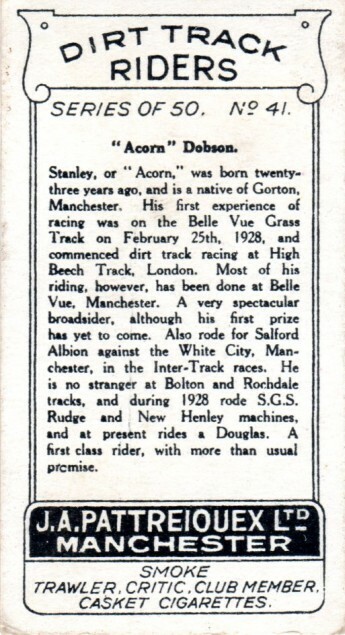 Stan got his "Acorn" nickname because some writers thought his head was shaped like an acorn! 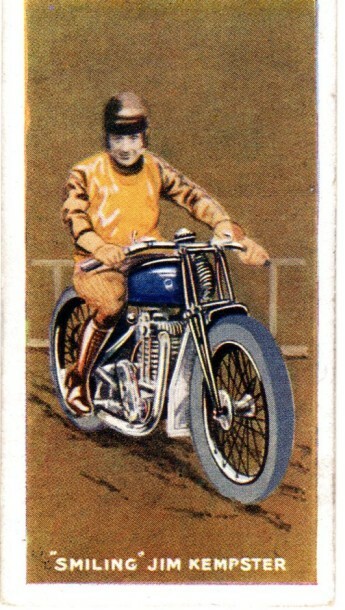 Bob (and the majority of UK riders) rode a Douglas Flat Twin like this one. 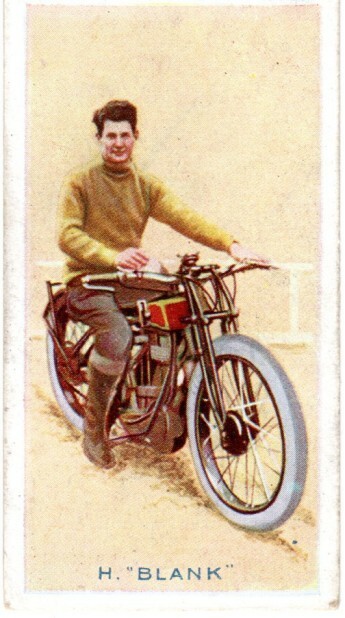 The Douglas was a twin cylinder machine when its opposition were all single cylinder bikes. 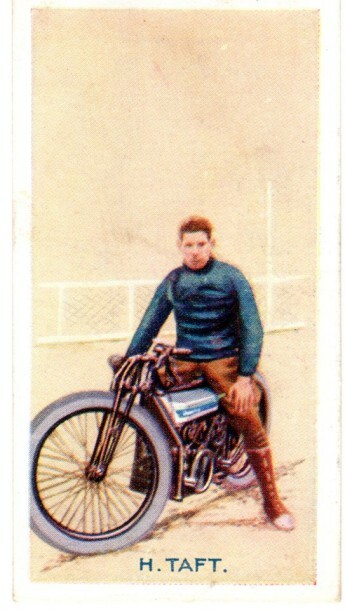 The Dougies cylinders fitted the frame from front to back increasing the wheel base of the bike. 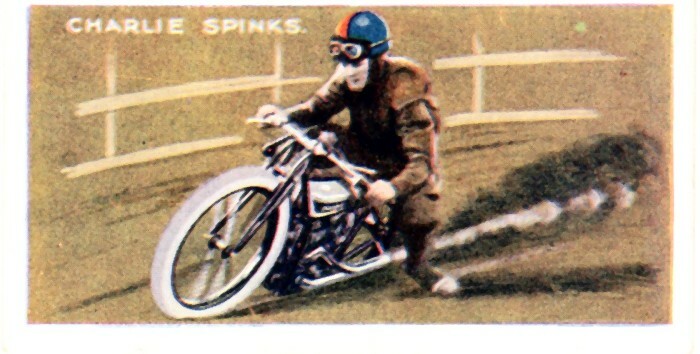 These bikes had all the weight at the bottom of the frame. 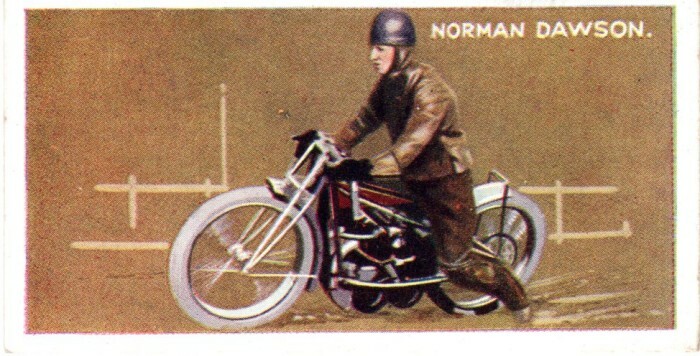 The configurement of the Douglas gave rise to the leg trailing style of its riders. 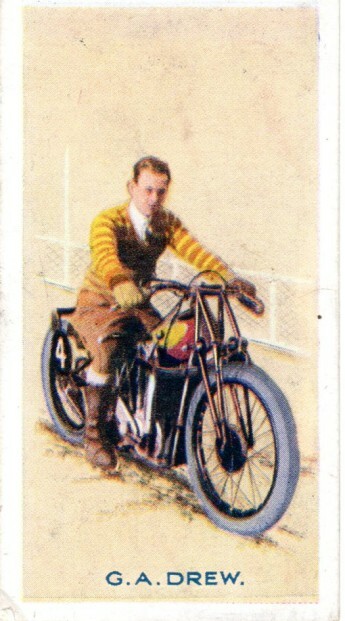 In the early years a number of riders rode 350cc machines against the usual 500cc bikes. 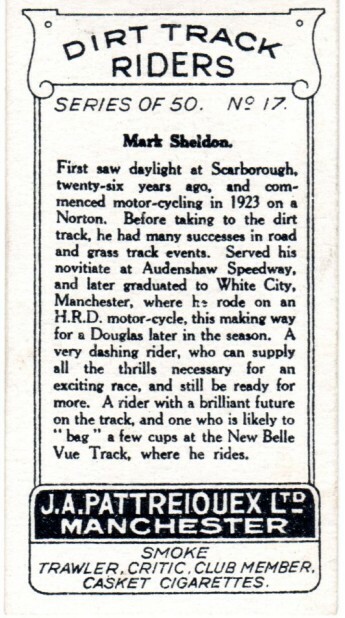 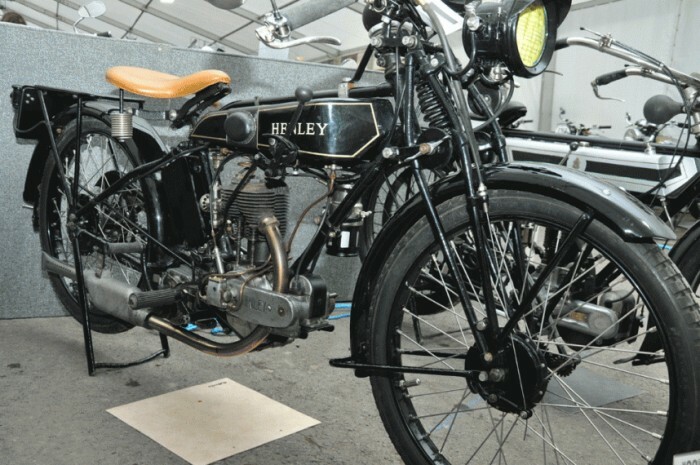 Harley, AJS and Velocette spring to mind as 350cc bikes Velocette also made a 400cc machine that was raced against 500cc Douglas, Rudge etc. 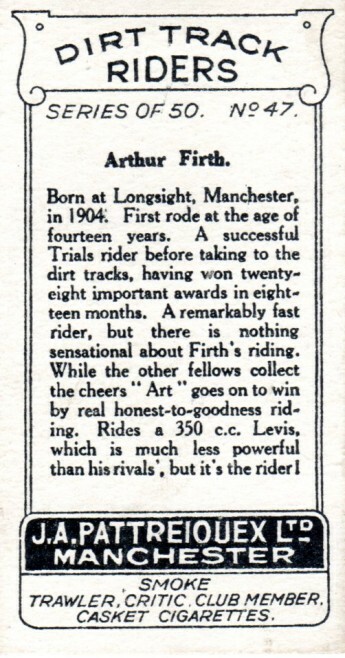 Arthur's Levis machine is pretty rare now so I cannot find a picture of one. 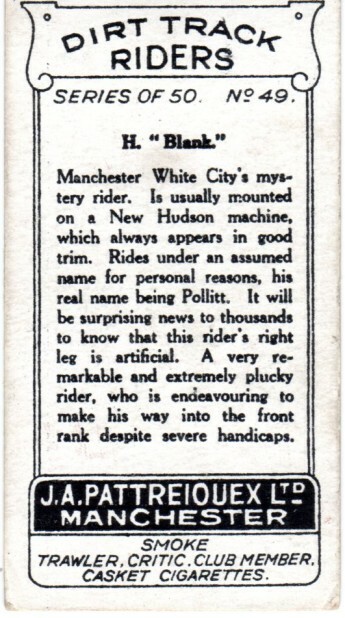 A strange rider going under the name "Blank" He also had an artificial leg. 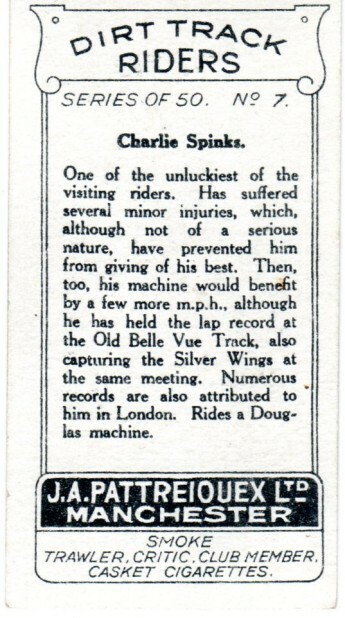 Mr Blank never reached the heights but with a 1920s artificial limb who could blame him for not being competitive.